We are honored to be a part of this beautiful boho themed wedding photo shoot and we are even more blessed to be featured in 2 of Quebec's most renowned wedding sites. Thank you everyone who was involved! :) What a dream team! This Canada Day, we drove to the beautiful Domaine Bouchard Champagne in Saint-Basile-le-Grand to set up the most adorable wedding of all time! K & D's rustic wedding focused on succulents in lieu of flowers and we are so happy with the results! The deep red accents were perfect to highlight the festive holiday and contrast all the varieties of green from the succulents. The bridal bouquet made of mixed succulents, hand tied with a trailing crimson red ribbon. I chose a few succulents that had a redish hue on their leaves to coordinate with the ribbon. Even the flower girl got to have some succulents on her petal basket! A few plants were wired to her basket and held in place by a red satin bow. Red rose boutonnieres for family members. Succulent boutonnieres from the groom, his groomsmen and the little ring bearers. A vintage style wood marquee letter used as a table number paired with succulent terrariums over burlap and lace table runners. The centerpiece was a mix of rustic elements that wedding guests could share and take home at the end of the evening. There may be a little snow falling down as I write this, but trust me, wedding season has started! We've already tackled a few weddings so far this year, but the wedding weekend lineup is about to start! A lot of brides who have smaller weddings, often come in a week or two beforehand to inquire about wedding flowers. There is no shame in that! However, you are limiting yourself to a smaller selection of flowers and colors by doing so. For the easy going bride, this is no problem. But if you already picked out your blooms and your Pinterest board is organized, don't wait any longer and come see us in store for a quick consultation on the spot! If you are in a hurry and just stopping by the shop, feel free to pop in for a 10-15 minute consultation during our opening hours. Otherwise, feel free to contact me to schedule a 30-45 minute sit down consultation to go over your dream wedding. I can't wait to see what your Pinterest board looks like! See you very soon brides of 2016! 1. Lucky bamboo gift favors - these tiny plants will bring good luck to all B+K's wedding guests! Packed in precious gift bags in matching wedding theme colors. 2. Enchanting outdoor wedding - an intimate ceremony that was simply magical! 3. Our van packed with carnations and baby's breath! We weren't sure we were even going to make it to the wedding venue in one trip. 4. A rich wine palette on a rustic table setting. It smelled amazing! 1. Bridesmaids' bouquets made with a lot of peach carnations creating a big statement! 2. An enchanted garden inside a lantern. This arrangement was born from Pinterest! Create an illusion. There are different ways to create the illusion of grandeur and everyone will think you spent thousands of dollars on decor! 1. Group simple cylinder vases together to create the illusion of a larger centerpiece. Using 3 different heights, gives the centerpiece more intrigue. 2. Submerging flowers underwater make the flowers seem larger than they really are. Tiny air bubbles form around the flowers, making them look like tiny diamonds placed around the vase. 3. Use candles to create an intimate feeling. Votives and floating candles are very trendy right now and an inexpensive way to add romance to your decor. 4. 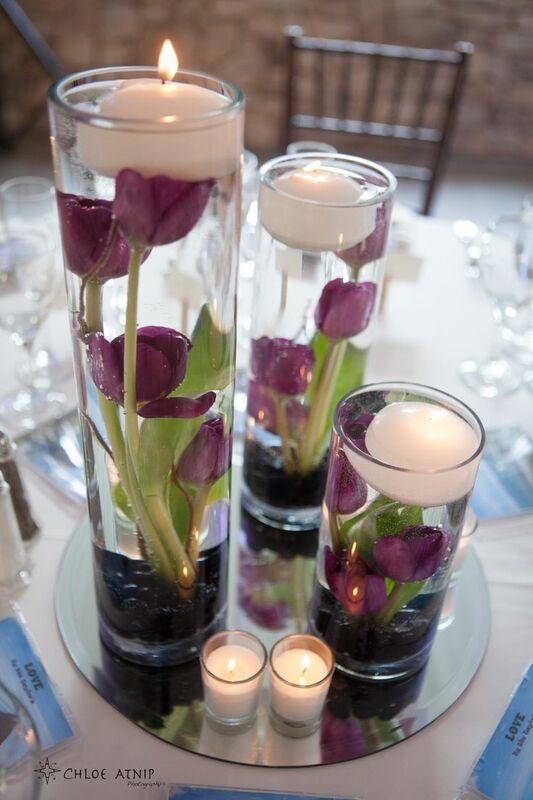 Round mirrors under your flowers give off a beautiful reflection of color and make your centerpiece seem larger. Just like when interior decorators place a large mirror in a small room to extend it, these table mirrors are a great way to enhance your centerpieces. Re-use and Re-purpose your ceremony flowers by bringing them into the reception area. There's no reason to leave any flower behind! Ask your wedding coordinator or groomsmen to transport the ceremony aisle flowers into the dining area. Large flower arrangements can be placed on both sides of a sweetheart table or at the entrance. Small floral pieces can be used for the cake table, sweet table or guestbook / gift table. At the end of the night, guests can take home the ceremony and reception pieces so no need to argue over who gets to take the flowers home. If you're a bride on a budget (and who isn't? ), consider bringing in your own vases to your florist. You can even DIY and decorate the vase yourself to match your wedding themes. The example above shows a savvy best friend who brought in vases she already owned. The theme was rich old school glamour, so I attached a rhinestone mesh around her vases to glam them up and voila! Luscious red roses and red carnations are a simple and elegant combination. Want to bring in your own vase but you don't have 10-15 of them for centerpieces? No problem! A new wedding trend is to have each guests table have a unique centerpiece. One of our brides found 9 different vases in her blue and green color scheme, perfect for her wedding theme. Although each vase is different, all of them will have white flowers to create uniformity in the reception hall. Consider even making each table number unique by using different picture frames, vintage books or mismatched candles. Make your decor memorable, your guests will be talking about it for years! We're already half way through wedding season and there are still many more weddings to go! We are fully booked for the summer but fall and winter brides, please contact us through our website to book a consultation. 1. Blue and white cascading bouquet. A few brides have been coming in and asking for blue flowers and this bouquet really packs in the vibrant and flashy color! The white roses and baby's breath add a little softness and more traditional look to the bright blue dendrobium orchids. 2. This large, large bouquet was especially requested by a peony fan! The peach, pink and white colors are gently mixed together. Unfortunately, peonies are done for the season. Sniff sniff... so many August brides are upset that they can't have this beautiful bloom. 3. Maid of honor and bridal bouquets packed in a box and ready to go! If you are on a budget, a mix of roses and carnations can go a long way, especially with our unique colors. 4. That's me! After setting up a wedding, I have a few extra minutes to snap a few photos hehehe! Follow us on Instagram for more of our arrangements! Follow us throughout the wedding season on our Facebook page where we will be posting new photos every weekend! Looking for flowers for your own wedding? Contact us to set up an appointment to discuss your wedding. Congratulations to J&S's romantic fall wedding last weekend! J's bridal bouquet was a total dream to create. I used large garden roses and ranunculuses in a soft pastel color palette, cream color hypericum, lace flowers and surrounded the bouquet in dusty miller foliage. I really loved making the mother of the bride and groom's corsages. The small corsage uses similar colors and flowers as the bridal bouquet with a touch of pink ribbon. How adorable is their sweet table decorations? The love birds carry ranunculuses, baby's breath and dusty miller with them to their new shared nest. More photos of the beautiful wedding to come! D's groom boutonniere made of red spray roses and cymbidium orchid. I love the little curl of the lily grass :) Little details are important, especially on smaller flower arrangements. The bridesmaid's bouquets were elegant and modern, made of red cymbidium orchids that create a ring around the white calla lilies. The shape is so unusual for wedding bouquets, it was so fun working on them! More photos from D&S's wedding coming soon! It's already been a few weeks since J&J's beautiful wedding, but I just hadn't gotten around to posting photos yet! The bridal bouquet is composed of cool water roses, purple and white dendrobiums and light lilac callas. The groom and the couple's fathers wore elegant calla lily boutonnieres paired with wax flowers and a dendrobium orchid. The centerpiece was an abundance of green fern and a gradient of color. Tiny diamonds were placed in the middle of the roses. So romantic :) Congratulations to J&J on tying the knot!